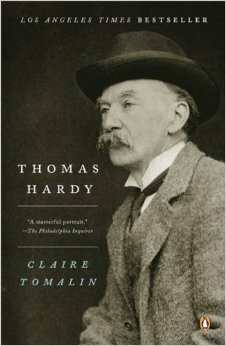 I was irrationally worried when I started reading Claire Tomalin’s biography of Thomas Hardy. You see, Hardy is my favorite writer, and I didn’t want to find out he was terrible, that he kicked puppies or something. Generally, I don’t mind reading books my people I don’t like much, but still, the idea that my favorite author could be a puppy-kicker … it made me nervous. In Tomalin’s telling, I’m happy to report, Hardy is not a perfect man, but he was a generally decent man. The UK edition has the subtitle, “The Time-Torn Man,” a phrase the speaker uses to describe himself in Hardy’s poem “A Broken Appointment.” The poem refers to a lovers’ meeting that didn’t happen, and Tomalin says that it is commonly believed to be about his love for a woman named Florence Henniker. Henniker is one of several women for whom Hardy suffered love or lack of it. And, in a way, all of his love affairs seem “time-torn” because there is often love, but it is torn away by time or the time when it could be shared is torn away. Tomalin begins her biography with the death of one of the principal women in Thomas Hardy’s life, his first wife, Emma, before moving back to tell his story from the beginning. Thomas and Emma’s marriage had been troubled toward the end, with Emma moving into the attic and having no more to do with Thomas than she had to. Tomalin writes with compassion about the growing discontent that followed what seemed a lively and romantic courtship in which the couple held strong to their love despite their families’ disapproval. She notes the reasons each one might have had to be unhappy and never quite comes down on one side or the other. But she does show that there was love there—or something like love. Other women are part of the reason for the marriage’s faltering. Hardy enjoyed flirting with the pretty women who loved his books, yet he also seemed to continue to seem attached to Emma. After her death, he wrote poem after poem expressing his regrets and sadness, yet, as Tomalin tells it, Emma rejected him as much as he rejected her. His second marriage is tainted by his memory of Emma, although, again, there is love, both before and after the marriage. Tomalin’s ability to see more than one point of view is one of the strengths of this biography. Tomalin does an admirable job of sticking to the known facts as much as possible, even including a robust notes section (with endnote numbers in the text!). Her choice of facts will perhaps reveal her biases to those more aware of whatever controversies exist surrounding Hardy’s life story, but she doesn’t appear to have an agenda, and it’s clear when she’s speculating. Speculation of the type Tomalin engages in, considering why Emma might have been unhappy, for example, can be useful in a biography, but I don’t have much interest in biographies built entirely on speculation. With Tomalin, I always felt I was in good hands. For me, the most interesting parts of the book were the chapters describing the novels—I think I just like thinking about Hardy’s novels! Tomalin puts his books in context of the time, commenting on how he compared to his literary peers and how his work was received. It’s clear that she loves his novels, and her insights reminded me of love much I love these books, even though I take issue with her complaints about the final words of Jude the Obscure, which I think are meant to convey a feeling experienced by this character in this moment, not a universal fact. The trouble with reading this book is that now I want to continue in my project of reading all Hardy’s novels—and I want to reread Far from the Madding Crowd and The Mayor of Casterbridge. A steady diet of Thomas Hardy couldn’t possibly be a bad thing, could it? 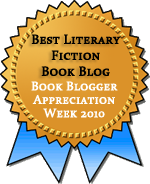 First off–hats off for having Hardy as your favorite writer–he comes second to Dickens in my house (all right, maybe third after Ruth Rendell), but he’s still near the top. I think Tomalin does a better job with Hardy than she did with Dickens; the fact that Hardy was not quite the man of the world as Dickens was makes his biography less exciting, but makes the connection with his writing even more interesting when you realize that, particularly in his poetry, he visits and revisits moments and imaginings from his life again and again. I’ve been on a Hardy kick this year, with my goal to finish all of the novels. I have only The Hand of Ethelberta left; I fear I have saved the worst until last. I just finished Two on a Tower and The Well-Beloved after touring Hardy country last month and visiting the grave at Stinsford where Emma, Florence, and Hardy’s heart is buried (along with the cat who tried to eat it–look that up), and also visited Westminster Abbey where his ashes lie interred next to Dickens’s body (Dickens has the much larger stone, while Hardy and Kipling have smaller, but contiguous, stones). One of the challenges with Hardy is to decide whether to re-read favorites or plow on through the whole oeuvre. Just don’t forget the poetry. I’m reading the Millgate biography right now; he’s very good at connecting the biography to poems. I have the Complete Poems beside me so that I can dip into it whenever Millgate references Hardy’s emotions relative to his poetry. Some of my friends laugh at my enjoyment of Hardy; they think he’s all about descriptions of sheep and rolling hills. I see him as so much more elemental; he can’t even start a story without invoking great themes, huge symbols, and the vastness of the universe and human history, against which the tiny movements of Tess, Michael Henchard, Jude Fawley, and Eustacia Vye seem like motes in sunlight. My personal favorite novel is The Woodlanders, without which Lady Chatterley’s Lover never could have been written, and is still the sexier book (at least in my mind). I also love the sweet Under the Greenwood Tree, a great introduction to Hardy’s work. Jude the Obscure is not for beginners, that’s for sure. Keep reading and reporting on Hardy, Teresa; let’s hope you make many converts. One of the reasons I’m torn about rereading or reading the unread books is knowing that I’ve read the best ones. But, as Tomalin notes, even his unsuccessful books offer something of interest, so I want to give them a try. I agree with you about the scope of his books–one of the things I appreciate about his writing is the way he puts people commonly viewed as outsiders and sets them against the wider world showing how the big ideas affect them too. It feels different from a novel of social consciousness, although that element is there. The Woodlanders is another one near the top of my reread list. And then there’s the poetry and short stories—so much to offer! I agree Claire Tomalin is a superb biographer. I loved this one too. I read it around the time I embarkded on my own Hardy reading challenge. Some friends and I finished it last summer. Having read all his novels two or more times and all the short stories at least once I am a massive Hardy fan. I think Tomalin presents Hardy realistically and with some affection and understanding. She does also make you want to read all his work again. I was so glad that her approach was neither worshipful nor condemning. She seems to admire him and his work without denying their flaws. I’m tempted now to go back to the start and read his novels in order, as you did. I’ve read Under the Greenwood Tree relatively recently, so I’d only have to backtrack by one. Sounds like this book is well worth a read; if the Millgate biography is by Michael Millgate, then it too is worth reading, as one of your previous commenters mentions such a biography. Claire Tomalin seems to have done so many worthwhile things in the last few years that it’s hard keeping up with her; thanks for your review–I hope I’ll be able to add this book to my TBR pile as soon as it gets a little lower! I’m going to keep the Michael Millgate biography in mind if I decide I want to read another Hardy biography, but like you, I find my TBR stays pretty high, so it’ll be a while! Isn’t it a relief when an favorite author turns out to be a decent person? There is always that fear that they were a number one jerk and if that was the case, what does one do? But I am glad you don;t have to worry about that! I’m sure if he turned out altogether terrible, I’d find a way to continue admiring his work. But I’m glad I don’t have to!